The exterior of Al Rawdah mosque is seen in Bir Al-Abed, Egypt, Nov. 24, 2017 in this still taken from video. 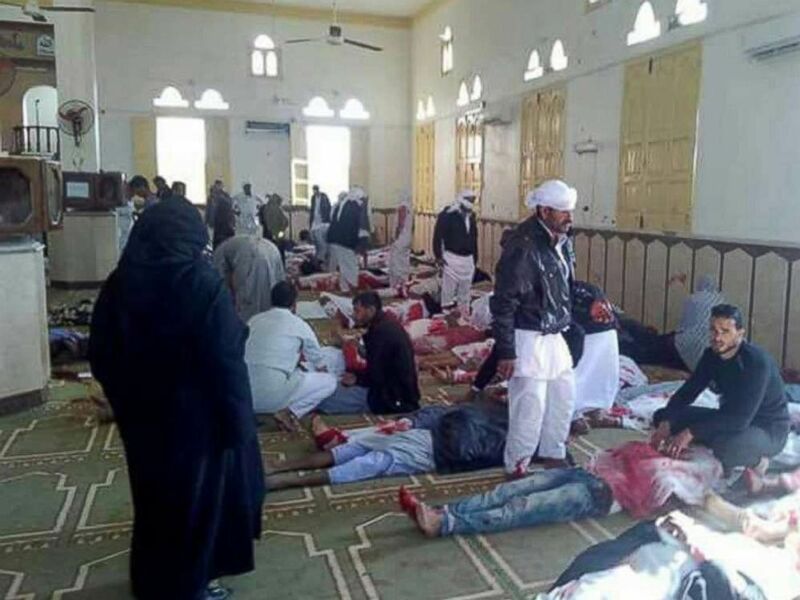 Bodies lined the walls at a mosque in northern Sinai in Egypt after an attack killed hundreds during Friday prayers. 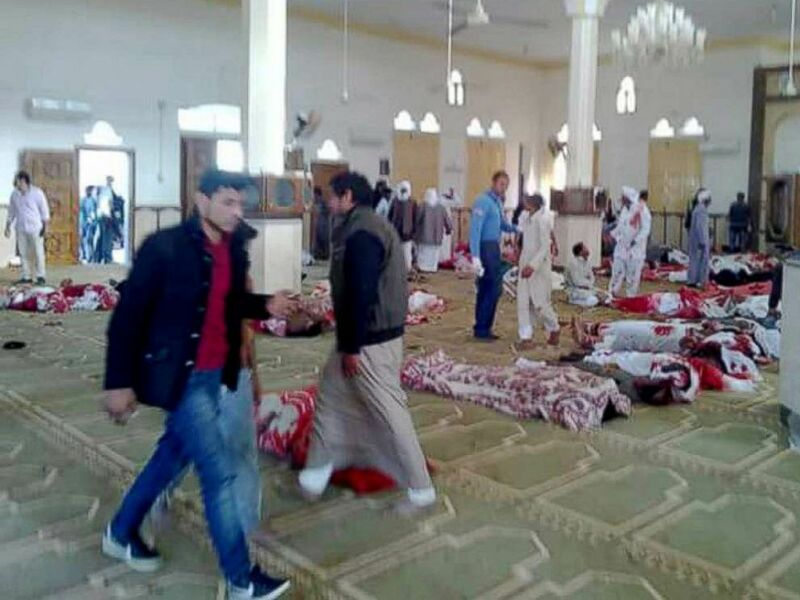 An eyewitness described the perpetrators as having stationed themselves at the mosque's three exits and deliberately attacking those who tried to escape the building, as well as passing vehicles, after first shooting some who were "kneeling in prayer." At least 305 people were killed and 128 more injured, according to Egyptian state news agency MENA. "The sight was horrific," the witness, Ibrahim Shetewy, told ABC News in Arabic, adding, "We carried whoever we found alive and took them in pickups and private cars until more ambulances could come and help." Shetewy described the mosque in question as one frequented by travelers on their way in and out of the area. He said the building is "huge" and was lined with bodies and a large quantity of shell casings following the attack. "Most of the people from the mosque's village are probably all dead, we saw 2-, 3- and 4--year olds dead. I saw a little boy with a hole ... in his head ... a horrible, horrible sight," Shetewy said. "... The mosque is huge and it was all full of dead bodies." "There was a woman waiting outside for her husband and young child to finish praying; she came inside and found them dead next to each other." 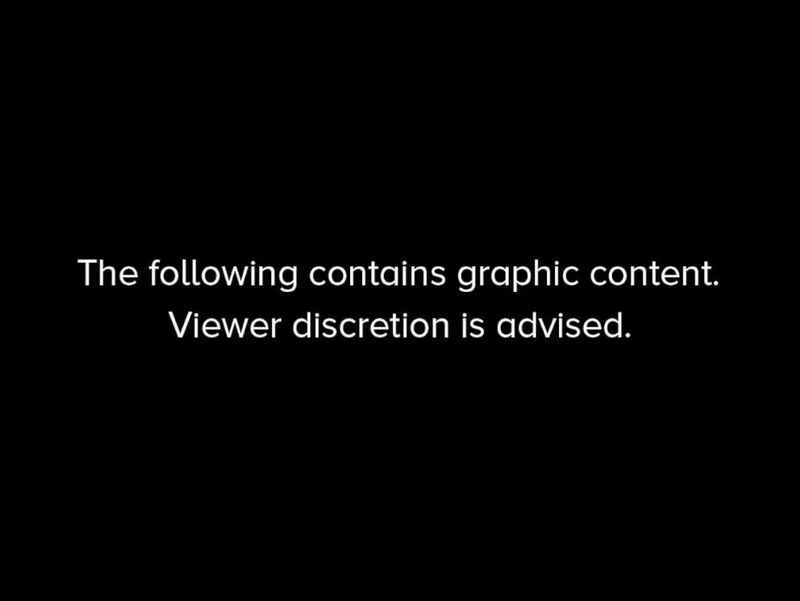 Photographs taken after the attack each show more than a dozen bloodstained bodies lined up on the ground of a building as those who appear uninjured tend to them. People sit next to bodies of worshipers killed in attack on mosque in the northern city of Arish, Sinai Peninsula, Egypt, Nov. 24, 2017. People stand over bodies of worshipers killed in attack on mosque in the northern city of Arish, Sinai Peninsula, Egypt, Nov. 24, 2017.